Bloomberg’s Gotham — where fun and freedom come to die. I hate when people smack their mouths when they chew gum. But I wouldn’t want the Bloomberg administration to pass a law banning it in New York City. The city has better things to do with my tax dollars, such as improving public schools. And yet this is the path the administration seems to be on, as Mr. Moynihan points out in Bloomberg’s Nanny State Targets Street Food. 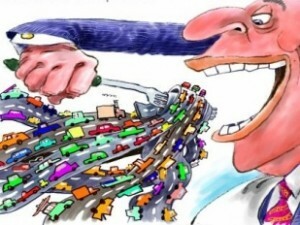 The Nanny State article shows why regulation can be very dangerous: entrenched competitors, in the form of brick and mortar restaurants, want to use the state to make it more difficult for trucks selling street food to do business. The city encroaches on individual liberty for a private purpose. This should not be the province of city government, or any government, for that matter. Of course, regulation has another negative consequence: it limits liberty. Smokers were easier targets than the street vendors for the city. That’s why Bloomberg first targeted smokers with his smoking ban in not only bars, but in parks, too. While I am not myself a smoker, I think this was going too far, too. With bars, the argument is that you are in a closed space and so smokers shouldn’t be able to impose their externality on non-smokers. I get it. That is not the case with the park. And yet, unlike with the park, most people go to bars to drink booze and more often than not get drunk. Their purpose is not health. Quite the contrary. Secondary smoke is part of the package. Bars should be free to choose whether or not they outlaw smoking. That will leave the right to choose where it should be — with consumers. In the case of New York City parks, smokers should have the right to use them, too. I am exposed to all sorts of pollution by choosing to live in New York City. Smelling some smoke in a park is not the worst of them. I hate when people smack their mouths when chewing gum, and when they blow loud bubbles, on the streets and subways. If I were mayor, I would pass a law banning those things, in addition to: sagging pants, tank tops on men, yelling in public, too much perfume (or cologne), too much popcorn eating, too many Yankee hats, live music on weekdays, impromptu music in parks, among others. At some point, such heavy handed regulation by the city will make Gotham the place where freedom and fun come to die.